With disruptive fintech (financial technology) entrants winning a major share of the global financial services sector, many experts have predicted a drastic transformation of the traditional bank toward digitally enabled services over the coming years. Despite the emergence of new business models, players and new products, banks will still have a major role to play in the industry as the fundamental concept of a trusted institution acting as a store of value, a source of finance and as a facilitator of transactions is not about to change in a hurry. However, the banking landscape is set to undergo significant changes during the next two to five years in response to the evolving forces of customer expectations, regulatory requirements, shifting economics and new technologies. Banks need to choose what posture to adopt against this change—whether to be a shaper of the future, a fast follower, or to manage defensively by putting off change. Banks who are going to emerge victors will not only execute relentlessly against today’s imperatives, but will also innovate and transform themselves to prepare for the future. This notion is true for Sri Lankan banks as well. According to the Central Bank Annual Report, the sector dominated the local financial sector by accounting for 60.3% of the total assets of the financial sector in 2017. The report further mentions how the era of digitalisation opened opportunities for Sri Lankan banks that never existed in conventional banking including mobile wallets, e-wallets, prepaid cards, contactless cards, and other digitalised alternatives which are gaining popular attraction. It further states, “the fast pace of change in fintechs and telecommunication companies has made the business models of banks more challenging and competitive,” hence banks need to thrive in the digital economy to compete with new entrants by being cost effective and introducing novel product innovations, based on customer insights. PwC’s report titled ‘Retail Banking 2020: Evolution or Revolution?’ points out that attracting new customers is a top challenge for banks over the next two years. “Banks are hungry for growth, and finding new customers is the first response of a good product banker,” states PwC in the report and recommends banks to focus more on addressing untapped areas and offer state-of-the-art solutions in order to deepen their customer relationships and enhance services. Priority banking, also known as premium banking, is one such untapped area for many banks across the globe in terms of introducing a novel digital platform to address the needs of a bank’s high net worth clientele. In the Sri Lankan banking sector, priority banking is not a new concept. Many local banks have joined the cause to tap their affluent customers. They provide personalised facilities for their high net worth customers who have a certain amount invested in the bank. Some of the specialised services offered to these priority customer are assigning Relationship Managers (RM), providing preferential interest rates, state-of-the-art priority banking centres with lavish facilities including swimming pools, unlimited food and beverages, boardroom facilities, free internet access and special gifts when the customer is celebrating a special life occasion. The basic purpose of this form of banking is to make the experience of banking exclusive, hassle free and less time consuming. It is designed in a way to deliver proven expertise in providing pragmatic and customised end-to-end financial solutions. Each day, banks put special focus on these customers, concentrating on their behavioural and buying patterns. Even with such investments on facilities, Sri Lankan banks face a number of challenges when serving these premier customers. Many of them lead busy work and life schedules. So they do not have a particular time to go and casually enjoy the luxurious client services offered at the Priority Banking Centre. It is also noteworthy that such centres are extremely cost-prohibitive and incur significant overheads to maintain and operate at their premium levels. Most of the time, a customer may still has to be ‘physically available’ to perform certain transactions at the designated Priority Banking Centre. This can be an inconvenience to a priority customer who needs a request to be serviced fast. Traffic congestion around Colombo (many priority banking centres are situated in Colombo) and overseas travelling schedules are other key challenges. On the other hand, relationship managers face certain difficulties. As per banking statistics, a relationship manager could visit only three customers within a single day. They often visit customers to process transactions, discuss about new financial investment products or to simply deliver a cake for their birthday, as a matter of courtesy. Most of the time, they tend to miss these appointments—sometimes the customer does not make it as he or she is stuck at a meeting or the relationship manager will not make it to the meeting as he or she is stuck in the traffic. Having to make visits to their priority customers in person is expensive and time consuming and the efficiency level of relationship managers is deteriorating by the day. In this context, Epic Technology Group—the premier fintech conglomerate in Sri Lanka and the region—has become the first to identify numerous digital opportunities which reside within the space of priority banking and introduce ‘Epic Premier Plus’, the state-of-the-art priority solution for banks. This ‘epic’ application is the pinch of sugar to all scrumptious caffè lattes offered at priority banking centres across the country, which enhances the relationship between the customer and relationship manager via digital channels. In a discussion with Daily FT, Epic Technology Group Managing Director and Chief Executive Officer, Viraj Mudalige explained the mechanics of the application. The customer application has a plethora of innovative features embedded in it. Biometric authentication, secure live video conferencing and real-time messaging with your relationship manager, card management, financial portfolio management, foreign exchange, loan and fixed deposit calculators and a dashboard enabled with augmented reality are few to name. “Functions we have enabled within the app brings extreme efficiency for customers. For example, the fixed deposit calculator will eliminate the need for any priority customer to visit a priority banking centre and discuss about portfolio management for hours with his relationship manager. With a click of a button, the customer can start a live video conference with his relationship manager and negotiate special rates, discuss maturity levels, set deadlines for RMs to get back with best interest rate options and even obtain a short term loan against any fixed deposit, if an emergency arises. The customer will be notified about each activity, each conversation via smart notification management,” said Mudalige. Apart from these functions, a customer can request for a chequebook, banking statements, PIN numbers, authorise transactions and sign mandates digitally. The customer app provides a dashboard view of the entire portfolio with an enhanced personal and digital touch. It is a one-tap communication platform, a convenient account and card management system as well as a simplified digital document-signing platform. For the first time in Sri Lanka, customers are empowered to manage their debit and credit cards on their own, using Epic Premier Plus. “If your card is lost, you do not have to call the card centre anymore; you can block the card on your own. If you feel that your card is unsafe during certain time periods, or when you want to allow limited overseas usage when you are travelling, you can deactivate it and reactivate by yourself, no matter where you are. Managing supplementary cards and their credit limits are also possible with the application where you can monitor every transaction through the customer app. This is what digital lifestyle means and it is a considerable cost saving from the bank’s perspective as well,” stated Mudalige. The app dedicated to the relationship manager also comes with a number of unique features including biometric authentication, secure video calls and messages, client appointments’ scheduler, client request viewer, digital signing of mandates and augmented reality based cards and notes. The app provides a platform for enhanced communication with the customer and 360 degree view of customer’s financial portfolio. The digital workflows of the application lessen documentation and manual processes and for relationship managers, it provides the ability to prioritise tasks based on the level of urgency. The interactive dashboard lets relationship managers understand their completed and pending work. One of the standout features of the RM app is augmented reality based cards and notes – anotherfirst in the industry for Sri Lankan banks. With this feature enabled, relationship managers do not have to travel all the way to meet and greet their customers on special occasions; they could wish them virtually through Epic Premier Plus’ innovative use of Augmented Reality (AR). “Imagine a situation where you are unable to meet the customer physically and you want to send him a document with some special instructions on how to get on-board with a new banking proposition. Rather than sending him a text or giving a call, you can send augmented reality-based guidelineson the same document. 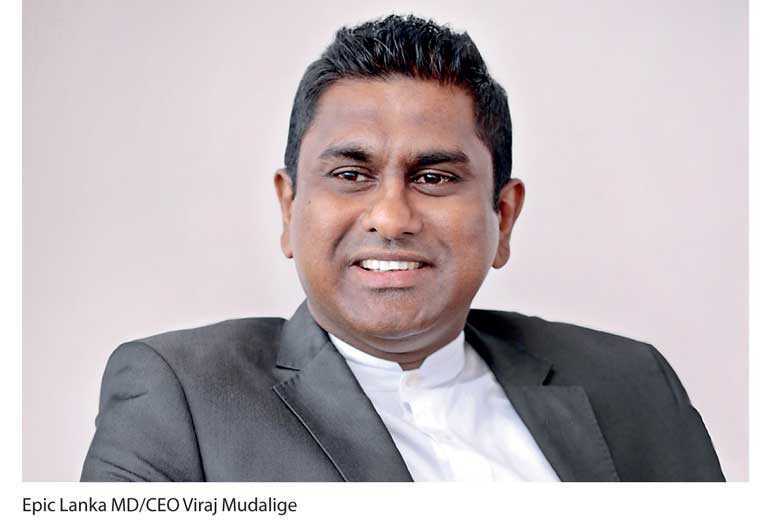 When the customer gets his hands on it and views it through the customer app, he will see a personally crafted set of navigational assistance to use the new proposition thus establishing a bank-away-from-bank environment.” Mudalige explained. With these digital enhancements, bankers could manage client portfolios on a real-time basis and be ahead of the game while also improving the ability to simultaneously serve multiple client requirements in a smarter working environment. Realtime financial dashboards enable bankers to monitor customer investments individually and offer tailor-made investment options with the intention of maximising customers’ wealth. For the first time in Sri Lanka, digital document signing for banking mandates will be introduced to customers further augmenting mobility features promised by this solution. This will be backed by Epic’s proprietary PKI technology and will run in compliance with the Electronic Transactions Act of Sri Lanka. Banks have so much on their plate right now—rising customer expectations, emerging competitors and changing regulations. Technology offers solutions, allowing financial institutions to cut costs and become more efficient at what they do. It will also help banks to rebuild their organisations around the customer and simplify their processes. They need to do things differently and focus on building innovative products to charter the uncharted territories of banking and financial services. Priority banking is one such area—not for global banks but for local banks as well. Mudalige highly believes that Epic Premier Plus will be ‘one stop digital priority banking centre’ for all Sri Lankan banks. “Epic Premier Plus is a symphony of priority banking benefits, personalised service and exclusive digitallifestyle benefits that bring complete harmony to all your premium banking needs. The ‘Made in Sri Lanka’ product designed to deliver proven expertise in providing pragmatic and customised end-to-end financial solutions. It is an exclusive service that is embarked for high net worth clients of a bank. It is about customer needs, goals, dreams and their aspirations,” concluded Mudalige.